Perforated with postcards on the reverse, this recruitment poster was designed by Cranbrook Academy of Art’s co-head of the design department, Katherine McCoy. McCoy pairs oppositional words across a center line, which serves as an anchor for a zig-zag effect created as more words and images fan out to the edges of the page. The composition of image and text is a play on deconstructivist ideas—you can read the text as an image and the images as text. The photomontage reinforces the bifurcation of the page, with the left side featuring designs from the 2D design department in pink, and the right featuring designs from the 3D design department in blue. 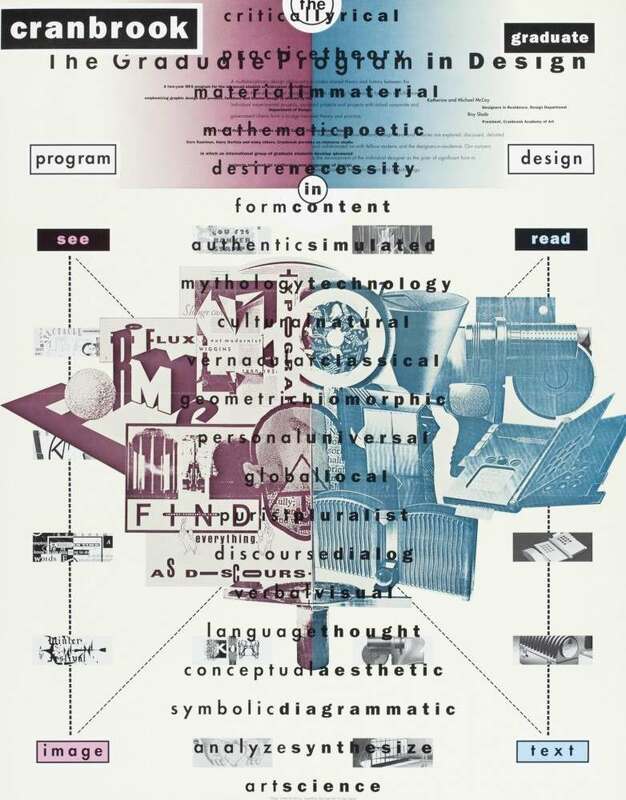 This poster is a marked departure from McCoy’s earlier work at Cranbrook, and remains an icon of postmodern graphic design.